I had an unusual view this weekend: Covenant Life Church from behind the FOH mixing console. I haven't mixed on a Sunday for many years, so it was great to give it a try again. With that in mind, my comments may be a little slanted this time. I was focused on my detailed responsibilities and not so much the overall production, which Ben and Josh were leading. Ben has agreed to write another Overdrive response to the weekend, so keep your eye out for that in the near future. Nevertheless, I thought I'd take share some thoughts from this Sunday. Bob Kauflin led us in three songs. Kenneth Maresco taught us about ordination. Josh charged the pastors to fulfill their responsibilities before the Lord. CJ Mahaney, Robin Boisvert, and Pastor Lee (Joe Lee's Dad) prayer for them and their wives. Bob led us in one more song. Out of the gate, I want to say this: amazing job, everyone. Whatever little mistakes may be bouncing around in your mind from the weekend, each one of you did a wonderful job. We had 20+ slides as well as 5 videos to play, which is significantly more than a normal Sunday. On top of that, I misdirected the video team, and we didn't have the right amount of lead-out time on any of the videos. That definitely made every cue a challenge, yet you executed with near flawlessness. We definitely have a 250Hz ring problem in the room, especially with E6 mics. I've heard it before, and now I've created it. The big problem is that the ring is inaudible at mix position. For safety sake, we should just notch a little 250 on all E6s automatically. Now I need your help. 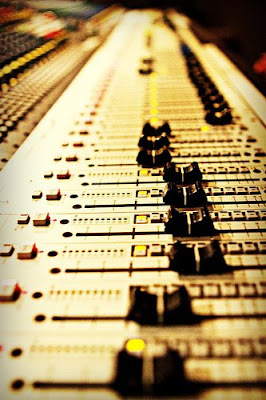 When I'm mixing, I want to be ultra-critical of the mix, so that we can keep improving in this area. What did those of you in the congregation think of the mix this weekend? I want to say a special thanks to Josh for taking the time to watch each of the five videos and write down the last two or three sentences of each segment. Having this information allowed us to synchronize lights, video, and sound and get out of each video as smoothly as possible. I want to make this an ongoing practice, especially when we have multiple videos on the same Sunday. Stay Calm. Act Carefully. I saw one DVD menu, one mouse cursor, and one edge of a Keynote window throughout the morning. With all that was going on, it's fantastic that those were the only things that happened. The key to avoiding littlegotchas like these is to stay calm and act carefully, even in the midst of "urgent" requests. Watch the waverform monitors closely. Many of the shots looked dark on the screen, especially during the charge and the prayer in the second meeting. This made it more difficult for the camera ops to get locked in on focus, so some shots were soft at the same time. On active Sundays like this one, everyone needs to be actively participating in getting these nuances of the shots correct from the tech director all the way to the camear operators. Craig did a great job with the lighting. I noticed that he made one mistake, though. He left the warm downlights on during several of the sermon cues. What's more? I thought it was a wonderful mistake. It added another level of separation between the cool background and the warm front-lighting, making the IMAG video look better. Let's keep doing this each week. I did wish that the lighting for the charge had been more even. On the videos, and even in the still pictures, the two guys in the middle were clearly brighter than the rest. I think this was a small moment where we missed an opportunity to really excel. You can watch a slideshow from Sunday that demonstrates what I mean. Your Turn. What did you think of Sunday's ordination ceremony? This is my first post to the ‘Reverb’ blog. Really, though, as a guitar player I’m not a big fan of reverb, so maybe I will call label my posts Overdriven or Telecasted. Just as long as the reader doesn’t think my posts are feedback and distortion! This Sunday, being a busier Sunday, was a good reminder of all the details that need attended to. Thanks for bringing all of your questions to me about when to move mic stands, when to put them down, how to change podiums (even though that was the last time we will change out the podiums like that). All of those details help avoid distraction...and its all of those details that I'm still learning to be on the look out for. Though I did not know the Josh and Les from Florida, I could tell they were very excited as I observed them observing what to us was a typical Saturday night evening. I’ve seen a number of people come through on a Saturday evening/Sunday morning who are simply observing how things operate at Covenant Life, and I don’t think their taking notice of families that serve with Christ like attitudes is anything to be overlooked. Honestly, it is uncommon, and for families like the Cowans and Schellhases to do it as often as they do with an accompanying Godly attitude is a great thing. One thing to keep in mind upon someone’s coming up on stage during/after worship is to display the least distracting shot. If someone in the band is in the background, its highly distracting and most likely makes the person in the background feel awkward as they are able to see the camera shot on the monitors in front of the stage. Most likely this means using CAM 1 as there is normally no one in the band behind the the person speaking center stage. Understandably, there are some Sundays (choir Sunday’s) where CAM 1 and CAM 2 will always have persons in the background. Any more comments from the team? Don DeVries preached just his second Sunday sermon at Covenant Life this weekend, called "The Privileged Status of God's People." Please listen and apply. What else happened on Sunday? Bob Kauflin led us in singing with an orchestra. Josh Harris announced some upcoming events. We saw the last installment of the Sovereign Grace Mission Fund Videos. I had the wonderful honor of spending the weekend with some new friends from Four Oaks Community Church of Tallahasee, FL. Josh and Les, that church's worship leader and one of its tech volunteers, were here to observe some of the things you are up to on the production teams. What did they come away with? They were inspired by the way so many people are clearly involved in the technical aspects, not only in setup and teardown. They were impressed with your agility, being able to adapt to surprises in the service order. They appreciated how the Cowan and Schellhase families serve together, from the youngest to the oldest. They noted the humility with which people serve, and mentioned in particular that Susannah was willing to ask for input on her camera work from her older brother, John. Thanks, Susannah! I was so thrilled to have them meet all of you and get to see you at work. Thanks for serving our Savior so faithfully each month. You are setting an example for people you've never met. The orchestra sounded the best ever! This is the result of great ideas from two of our mixers. Specifically, the last time that Julie mixed the orchestra, she noted that it was helpful to use slightly more of the strongest player from each part. This helps get more gain and yet maintains the large group sound. Jim took this approach to the next level by placing a Beta98 clip-on mic on each of those "first seat" players in order to get even more gain before feedback. This accomplished two things: When the orchestra was being featured, the ensemble sound was full and rich. However, when the band got loud, he was able to get just that little bit of extra gain from those four clip-on mics to make sure the strings didn't get lost. We must know when a video ends. In the first service, the lights came up early and the video transitioned away before the actual ending. Thankfully, Dennis caught it quickly and got the video back on the screen before anyone noticed what happened. However, it did lead Josh to talk over the last few seconds of text that described who would receive the contributions given to the Sovereign Grace Mission Fund. One suggestion: the playback operator (which we didn't have on Sunday, by the way) should know the length of the video and count down to the ending. Give a one minute and thirty second warning, and then c0untdown seconds -- 10-9-8-7... -- to the end, so that everyone knows the exact end moment. Changing pulpits doesn't work after the introduction of the speaker. It draws too much attention to the fact that Josh uses a short pulpit and others use a tall one. Since Ben will be leading weeks 3 and 4, I will be posting thoughts from him later in the week. Until he finishes his reverb, what did you notice that was great or could be improved? 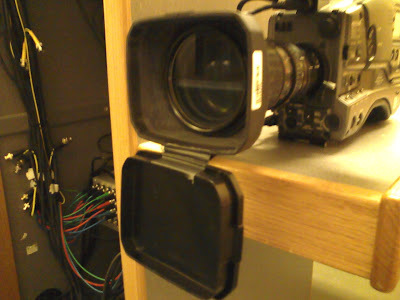 As a sidenote, Isaac, one of our camera directors, attached all the lens caps to the cameras, so that they don't get lost. Please don't tear these off. Thanks, Isaac, for your initiative in this.